Hybridized in the Gardens of Jeff & Jackie Pryor, Clinton Tennessee, where winter sees little snowcover and repeated freeze/thaws, SK is one tough northern hardy Daylily. Big robust tetraploid foliage is notable for its rich green and blemish free nature. The budcount, branching, and long weeks of mid-late season bloom is what makes this cultivar stand out in the garden. A mature clump during bloom season is quite the traffic stopper. Extremely well branched (4 & 5 way), 38+ buds, a bud builder. Yellow gold with a bold maroon eye and edge. 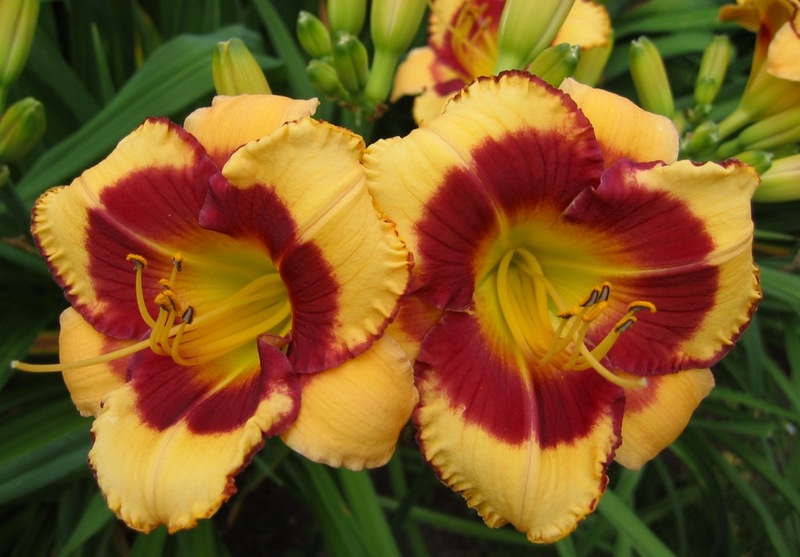 A mature clump with multiple scapes will put on many weeks of a show with multiple blooms open every day. The substance is heavy, yet the flowers never fail to open fully. Spectacular as a display clump.